WWF is calling for the immediate closure of the Mediterranean bluefin tuna fishery to give the species a chance to recover, while continuing to encourage consumers, retailers, restaurants and chefs to join the global movement to avoid the consumption of the imperiled fish. You can read their full report here: Hungry Oceans: What Happens When The Prey Is Gone? 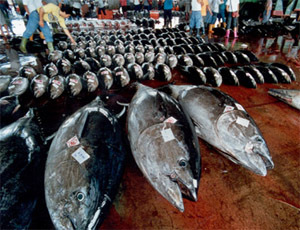 Bluefin tuna are on the brink of extinction due to overfishing. The oil spill in the Gulf of Mexico, the spawning ground for all Western Atlantic bluefin tuna, now further jeopardizes their recovery. Ask the government to protect and restore populations of bluefin tuna in the Gulf. Adrian Grenier, best known for his role on HBO’s “Entourage,” recently joined Oceana’s campaign to protect bluefin tuna. 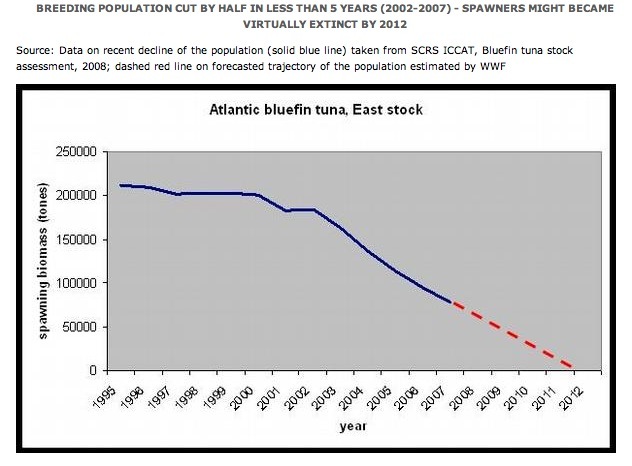 The abundance of Atlantic Bluefin Tuna is at a critically low level and a fishing moratorium is needed to prevent population collapse (Safina and Klinger 2008). It’s become abundantly clear in recent years that the agencies that are supposed to regulate fishing are caught in the nets of the fishing industry. 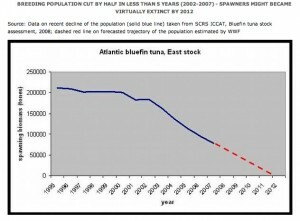 Saving the bluefin, then, requires putting unsustainable seafood purveyors on the hook. Sign our petition asking Nobu restaurants to immediately remove bluefin tuna from their menus, and take the Center for Biological Diversity’s pledge to stop eating bluefin tuna and boycott dining establishments that serve the fish. It’s the only way to ensure that there really will be plenty of bluefin in the sea. And finally, consult our Guide to Ocean Friendly Seafood or FishPhone for more information about Atlantic Bluefin, and consider alternatives to bluefin when dining or shopping. As always, all of us at OMG wish to thank you for caring and for showing your support. Together, we can make a difference.